Guitarist, Banjoist & Composer John Marcinizyn performs frequently as a soloist, guitar duo, guitar and flute duo, guitar and violin duo, guitar and voice duo, and groups ranging from The Bach Choir of Pittsburgh to his jazz trio Acoustic Swing. His versatility as an acoustic and electric guitarist allows him to perform in many styles including classical, jazz, rock, blues, and folk. 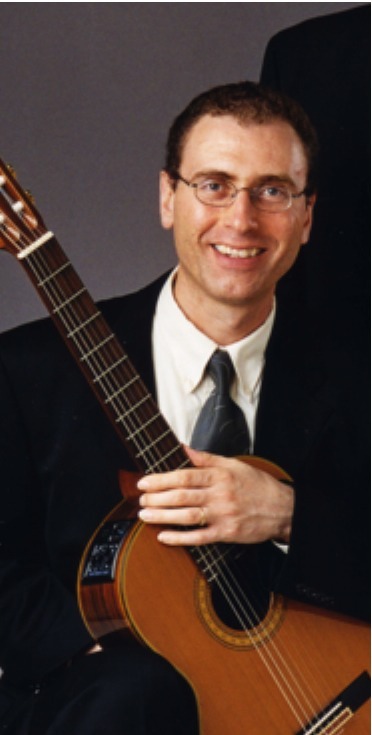 John’s solo guitar and ensemble repertoire spans all centuries of classical music from the Renaissance to the present as well as Spanish, flamenco, Latin, American Fingerstyle, and arrangements of jazz, and popular music. His playing can be heard on six CDs and one DVD. John has also performed guitar and banjo for many theater companies including Quantum Theatre (Where he wrote and performed a flamenco score for The Red Shoes and a Blues score for El Paso Blue), Open Stage Theater, Pittsburgh Irish and Classical Theatre, and Pittsburgh Playhouse Repertory Company. John’s original music compositions have received numerous performances and include a guitar concerto, string quartet, orchestral music, music for theater, and pieces for solo guitar and guitar with mixed ensemble, as well as a number of jazz and rock pieces. His Sonata for Guitar and Marimba received critical acclaim following its premiere at the Guitar Foundation of America International Festival and Competition held in Buffalo. The Westmoreland Symphonic Winds commissioned a piece, Song for the Sparrows (an orchestral suite in memoriam of the two young symphony members killed in the 1988 terrorist bombing of Pan Am flight 103) that premiered to acclaim at Seton Hill University.